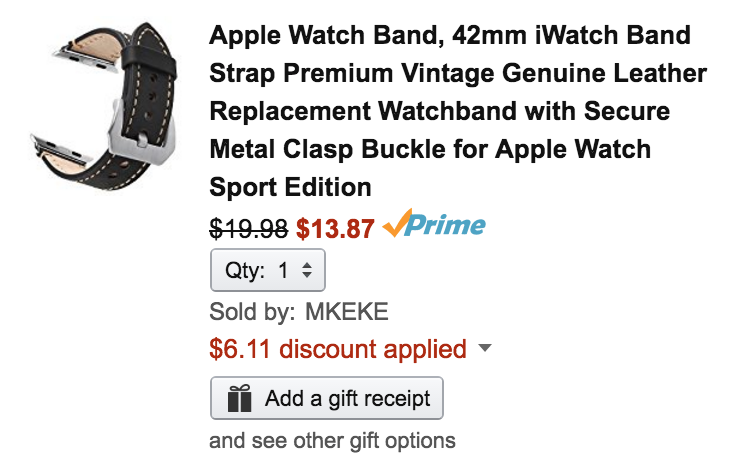 MKEKE (98% positive feedback all-time) via Amazon offers its 42mm Leather Apple Watch Band in Brown or Black for $13.87 Prime shipped after promo code 8IVOVYM6 is applied during checkout. That’s 30% off the regular price, down $3 from our previous mention and the best available. Instead of going down the road of Apple’s bonkers pricing model for replacement bands, give this third-party option a try. In our experience, most of these alternatives are pretty good. Over 830 Amazon customers have left a 4.5/5 star rating. Looking for something a bit more sporty? We still have an exclusive discount on Clockwork’s nylon bands including the popular Pride model. We like Apple, we like Fashion. We like everything about Apple. We are big Apple Fans. We are dedicated to produce Apple Watch Bands with high-quality, comfortable touch feeling and fashion. We try our best to make all perfect accessories to Close Apple’s Style. Top Leather Strap – made of 100% premium soft top genuine leather with fashionable craftsmanship, comfortable touch feeling on your wrist, anti-slip & sweat-absorbent. Wristband with Stylish Design – simple low-profile design makes your Watch a more attractive, fashionable and classy look.